Chemistry: (Mg, Fe)2SiO4, Magnesium Silicate. Forsterite is named for the German naturalist, Johann Forster. It is one of two minerals that are simply known as olivine. The other mineral is fayalite. Fayalite is the iron rich member with a pure formula of Fe2SiO4. Forsterite is the magnesium rich member with a pure formula of Mg2SiO4. The two minerals form a series where the iron and magnesium are substitutable for each other without much effect to the crystal structure. Fayalite due to its iron content has a higher index of refraction, is heavier and has a darker color than forsterite. Otherwise they are difficult to distinguish and virtually all specimens of the two minerals contain iron and magnesium. For intermediate specimens or those difficult to differentiate as well as simplicity sake and general public recognition, they are often treated as one mineral, olivine, although it is not officially recognized as a mineral. Forsterite's gemstone variety known as peridot, is one of the most mispronounced of gemstone names. The correct pronouciation has peridot rhyming with doe or depot. But peridot is often pronouced incorrectly so that it rhymes with dot. Peridot is the birthstone of August and is usually a very affordable colored gemstone. Unfortunately it is often compared to the rich dark green of emerald and in this comparison it is often found lacking. But peridot has its own unique green-yellow color that is different from emerald and this comparison is rather unfair. Most peridot is forsterite and its color is caused by the presence of iron ions. Fayalite's higher iron content make for darker, less attractive specimens that are not generally used as gemstones. The best colored peridot has an iron percentage less than 15% and includes nickel and chromium as trace elements that may also contribute to the best peridot color. Most gem grade forsterite comes from volcanic basalts, but the gem gravels of Mogok, Myanmar (formerly known as Burma) are thought to have weathered out of peridot-containing metamorphosed marbles. Forsterite is also found in many iron-nickel meteorites. Not just as small grains but as significantly sized crystals sometimes occupying over 50% of the meteorites volume. Thinly cut slices of these meteorites are extremely attractive with the polished steel gray of the iron and the embedded grains of gemmy green forsterite crystals. The effect produces the closest mineral equivalent to stained glass artwork. Some meteoritic forsterite/olivine crystals have been cut into gems. Color is a light green yellow to the more common yellowish green; also known to be colorless. Crystal Habits include flatten tabular to box shaped crystals, but good crystals are rare. More commonly found as grains in alluvial gravels and as granular xenoliths in magnesium rich volcanic rock. Also massive. Twinning is rare, but has produced star shaped trillings. Cleavage is poor in two directions at 90 degrees, rather indistinct and rarely noticed. Specific Gravity is approximately 3.2 when pure Mg2SiO4 and rises with increasing iron content (somewhat above average for non-metallic minerals). Other Characteristics: Index of refraction is 1.64 - 1.71 and has double refraction. 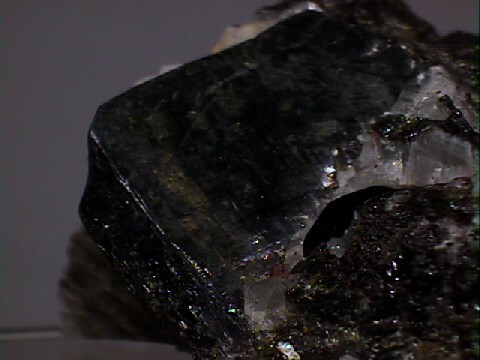 Associated Minerals are diopside, spinel, plagioclase feldspars, chromite, magnetite, talc, hornblende, serpentine, iron-nickel meteorites and augite. Notable Occurrences are numerous and include the ancient source of Zagbargad (Zebirget) Island in the Red Sea off the coast of Egypt and Mogok, Myanmar (formerly known as Burma). The type locality is Mt. Vesuvius, Italy and other localities include Kohistan, Pakistan; South Africa; Ural Mountains, Russia; Norway; Sweden; France; Minas Gerais, Brazil; Eifel, Germany; Chihuahua, Mexico; Ethiopia; Mt. Franklin, Victoria, Australia; Notre-Dame-du-Laus, Quebec Canada; China and Salt Lake Crater, Oahu, Hawaii; North Carolina; Bolton, Massachusetts; Crestmore, California; New Mexico and the most productive source of peridot to date from Peridot Mesa, San Carlos Apache Reservation, Gila County, Arizona, USA. Best Field Indicators are color, hardness, mafic or metamorphic environment, lack of good cleavage and density.